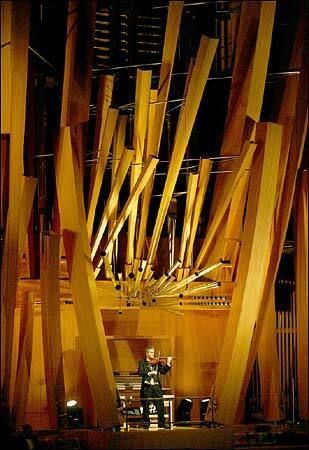 Martin Chalifour playing in the Walt Disney Concert Hall in Los Angeles, disigned for a variety of musical styles. After Charles Garnier designed the Paris Opera in the 1870's, he called acoustics a "bizarre science." "Nowhere did I find a positive rule to guide me," he wrote. "I must explain that I have adopted no principle, that my plan has been based on no theory, and that I leave success or failure to chance alone." He compared the acoustician to an acrobat "who closes his eyes and clings to the ropes of an ascending balloon." The science of acoustics has taken flight since then, but not without many a deflated reputation and misguided journey along the way. Over the last 50 years, more computing power has been applied to acoustic data than ever before, but most big halls have turned out to be dry and pale frames for music. After all, Avery Fisher Hall had been planned as the apotheosis of the new science of acoustics: Leo L. Beranek, its first acoustic designer, was an electrical engineer who studied signal processing and noise dampening. He had surveyed more than 50 concert halls throughout the world. Nonetheless, Fisher Hall, then named Philharmonic Hall, opened in 1962 to widespread unease. Fourteen years later, the inside was destroyed and replaced. But the problems didn't end, and so, after decades of tinkering, Lincoln Center announced this week that sometime after 2009, the hall would be gutted again. Concert halls used to shape sound; now sound shapes the halls. Some of those problems, of course, are particular to Fisher Hall. Against Mr. Beranek's advice, for example, the hall's original volume and shape were altered to allow more seating. The acoustics in the latest version are also not as bad as their reputation: for instance, the hall's renowned glare became far more mellow once its resident orchestra, the New York Philharmonic, shed the brash nerviness it had cultivated in the 1980's. But Fisher has also faced the problem of any hall that is less than great; it cannot compare to Carnegie Hall or to Symphony Hall in Boston or to the major halls of Vienna or Amsterdam, where every great orchestra has played and the luckiest listeners have sat: halls where sound can seem to have both substance and space, surrounding and, at times, caressing the listener. As Mr. Beranek himself wrote, "The old halls that are still standing are among the best that were built." That is why they are still standing. The missteps in Fisher Hall, however, may also reflect a deeper confusion about the nature of concert halls and the role acoustics plays within them. This is an artistic issue, not a scientific one. For a great hall not only determines how music is heard, but also helps determine what music is written. Halls don't just present culture, they shape it. As Michael Forsyth shows in his 1985 history of concert halls, "Buildings for Music: The Architect, the Musician and the Listener from the 17th Century to the Present Day" (M.I.T. Press), each style of music is associated with a style of space. Gregorian chant, with its measured pace and contrapuntal simplicity, seems inseparable from reverberant cathedrals and stone walls. The same spaces would muddle the harmonic transformations and abrupt motives of a Beethoven piano sonata. The gestural elegance of music for the Baroque court would be immediately lost in an outdoor amphitheater. Some of the gracious, expansive charm of Handel's organ concertos may derive from his awareness that they were being performed in the Rotunda of the Ranelagh Garden in London, where the listening public would promenade. So, too, with the concert hall. It is no accident that its main repertory remains music that was specifically written to be played in such halls  symphonies, concertos, overtures  or that the music written during the 19th century, when concert halls moved to the center of musical life, remained the music at the center of concert hall life. The building is inseparable from its origins and from the music it inspired. Other musics visit the concert hall; they are not at home in it. The building defines the nature of the listening public as well. When a concert hall's acoustics fail to welcome listeners into a world of felt sound, when they strip away resonance and emphasize distance and detail, they seem to alter the communal function of the concert hall. They make music seem as if it were something existing "out there," something to be respectfully and carefully heard rather than something intimately and urgently shared. But that is what tended to happen to concert hall sound during much of the 20th century, and that, too, reflected a changing aesthetic. The music of Modernism demanded a kind of sonic ruthlessness, a crispness and unforgiving clarity. Often, it took a polemical stance toward the mainstream audience as well. How could this not affect the sonic character of halls? This development also coincided with the beginnings of acoustics as a science. The first acoustical specialist ever to work on a concert hall was Wallace Clement Sabine, a physicist at Harvard University, who discovered important laws governing sonic reverberation and applied them to the design of Symphony Hall in Boston. That hall, which opened in 1900, now bears a plaque calling itself "the first auditorium in the world to be built in known conformity with acoustical laws." But Symphony Hall was the last great concert hall of the 19th century rather than the first of the 20th. It was unaffected by Modernism. It had a single dedicated function: to serve orchestral sound. Sabine was trying to discover the nature of acoustic success, not reinvent it. Afterward, as Emily Thompson shows in "The Soundscape of Modernity: Architectural Acoustics and the Culture of Listening in America, 1900-1933" (M.I.T. Press, 2002), acoustics took on a life of its own. The Acoustical Society of America was organized in 1929. Increasingly, electrical tools were used not just in analyzing sound but also in reproducing sound, both in the halls and the home. The sonic frame of reference shifted. The grand movie palaces of the early decades of the century, for example, were meant to invoke European opera houses and had similar acoustics. (Some even featured orchestras to accompany silent films.) But by the late 1920's, speakers and amplification were essential for the new talkies. When Radio City Music Hall opened in 1932, its acoustics presumed amplification. As the concert hall became more clinical, the theater became more enveloping. Ms. Thompson also argues that one of the main preoccupations of acousticians of the time was not the presentation of sound, but its prevention: sound control became an industry. The ability to control sound, either through dampening or amplification, also affected the evolution of concert halls. During the 1930's and 40's, Ms. Thompson points out, halls were often built with drastic dampening in the auditorium and increased reverberation on the stage: the hall began to resemble a loudspeaker. Mr. Beranek described the effect of the Kleinhans Music Hall, built in 1940 in Buffalo, as "rather like listening to a very fine FM stereophonic reproducing system in a carpeted living room." The halls of the late 20th century have often been described as having a hi-fi sound. (In the case of Avery Fisher Hall, hi-fi was even the source of its main donor's fortune). In addition, the function of the hall itself began to change. Carnegie Hall has always been host to a wide variety of music, but its standard for design and sound was the orchestra. The premise of the late-20th-century hall was that while it created a home for an orchestra, it should be adaptable to all musical styles and functions. So it has become customary to speak of "tuning a hall." Philharmonic Hall had adjustable panels; so does Avery Fisher. Many new halls go even further, with adjustable hollowed spaces and panels, variously called resonance chambers, clouds, canopies and closets. In some cases (like that of the New York State Theater when it is used by the New York City Opera), there are even electronically controlled sound-shaping speakers. Given psychoacoustical research into sound perception, and given the way ears are now accustomed to artificially hyped home theaters and electronically processed sound, who knows what temptations lie ahead? There are risks in serving too many kinds of listeners. This means that the hall is no longer a force that inspires particular styles of music and forms particular communities. It is instead meant to give way before their varied demands. It serves; it does not shape. So the hall has less of a focus. Instead of serving one ideal well  the ideal embodied in a 19th-century orchestral hall  it serves all ideals with compromise. Is it possible that this makes it more difficult to love a new hall deeply, let alone to love deeply its sound? This may be why some of the most affecting musical spaces of the last decade have not been the large halls, but the smaller ones, built for specific purposes. Perhaps the next Avery Fisher Hall will break with this tradition, and new forms of culture will emerge. But the risk is that it will be something of a hybrid: a throwback to the 19th century in its presence and ostensible function, a representative of the 20th in its requirements for clarity and demotic variability, and a harbinger of the 21st in that it will be so malleable that it will hardly matter when it finally gives way before yet another incarnation. Copyright 2004 The New York Times Company. Reprinted from The New York Times, Arts & Ideas, of Saturday, May 22, 2004.